This picturesque, unassuming resort is set on the side of a tree covered slope with steps leading to a glorious white sandy beach. There is an excellent variety of rooms available with each offering a private balcony, where you can admire the sunset at the end of each day. Each of the two restaurants feature a delicious spread of dishes and provide splendid sea views. The Baimai Spa offers massages, body wraps and scrubs to soothe and invigorate you. This is a lovely resort which is perfect for a relaxing holiday with a natural feeling of seclusion. In Jasmine superior main building rooms facing the sea, with a view of the trees and gardens, with air-conditioning, ceiling fan, shower, fridge and balcony. There are steps from the lobby and rooms to the beach, therefore the resort is not recommended for the less mobile. 01 Nov-23 Dec 19 if you book at least 30 days before arrival. 08 Jan-31 Mar 20 if you book at least 60 days before arrival. 01 Nov-23 Dec 19 if you book at least 60 days before arrival. 16 Apr-31 Oct 19. Compulsory breakfast payable. 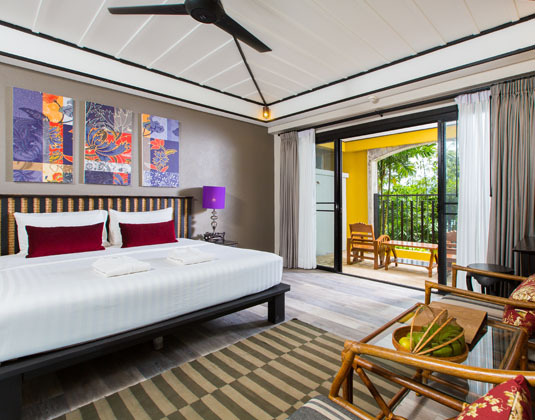 16 Apr-31 Oct 19 if you stay at least 10 nights receive an upgrade to next room category. 01 Apr 19-31 Mar 20 receive Welcome drink, fruit and flower decoration.